Ron Patterson, artist and President of Smart Music Entertainment, Inc. is cultivating his growing relationships in the Japanese market. He released an exclusive album in Japan in 2008 called “My Secret” through Toy’s Factory a major label in Japan. The “My Secret” album included some of Ron’s already popular songs from the U.S. such as “Girlfriend”, “Get It Girl”, “Bittersweet Love” , and “Storybook”. 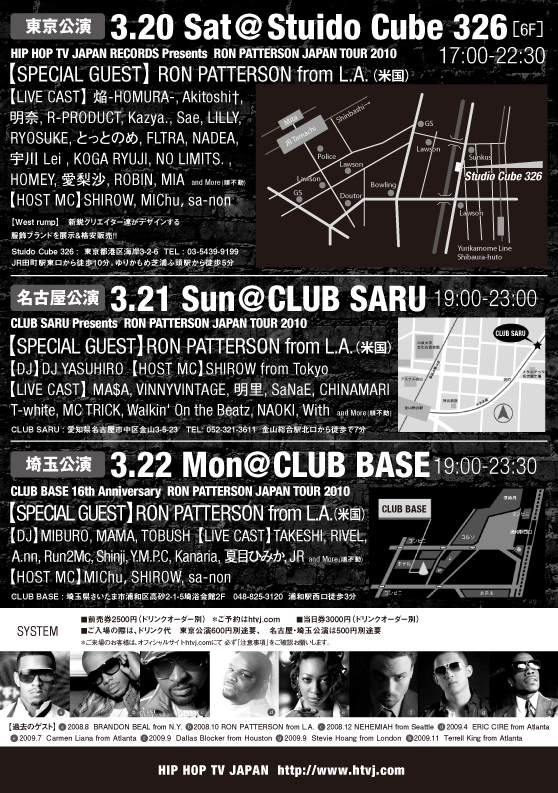 In 2010 Ron has entered into a joint venture with Hip Hop TV Japan Records a new up and coming label in Japan to release a new Ron Patterson album (title not yet disclosed). Singles will be released as soon as the Summer 2010 and the full album is scheduled for release on October 20th 2010. We welcome your continued support for Ron Patterson. He is making his way to the top passing up the majors with the strategies designed by Smart Music Entertainment, Inc.
March 2010 The Smart Music Entertainment Media Group has redesigned the Official Ron Patterson Artist Website. After consulting with Ron Patterson himself, we collectively decided that an artist website should consist of live and dynamic content. We are excited about Ron’s exponential growth in the music industry globally and www.ronpatterson.com will be a central portal for his active movement towards continuing success. Backed by The Smart Music Entertainment Media Group and hosted by The Wordpress Blog Tool and Publishing Platform, you will enjoy rich real-time content including upcoming events/tours, free music downloads, videos, articles/posts, and pictures. We encourage you to enter your email into our Email Database (located in the right column) for live updates, guest lists, and more. Thank you for your support and we invite you to spread the word about WWW.RONPATTERSON.COM.